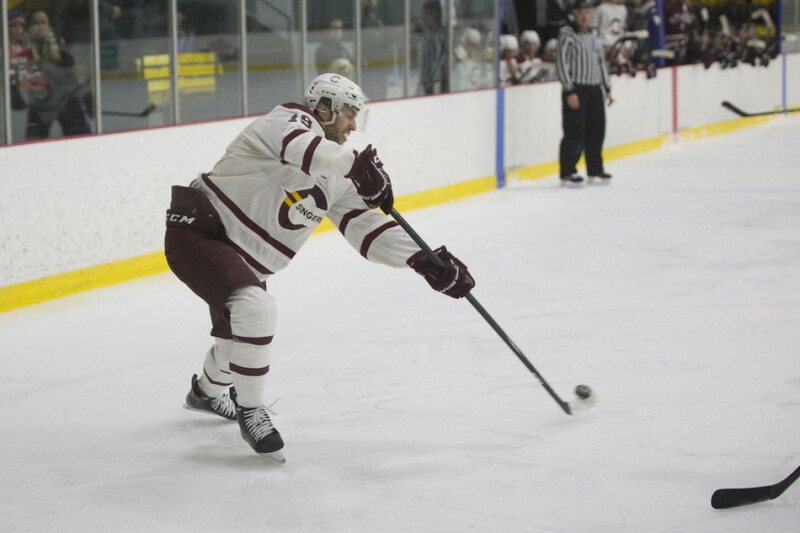 A slow start turned into a methodical, defensively smothering win for the Concordia’s men’s hockey team. In the first game of the best-of-three playoff series against the University of Ontario Institute of Technology Ridgebacks, the Stingers got off to a sluggish start, looking tired and perhaps a bit nervous. However, it wasn’t long before Concordia’s run-and-gun style of offense was on full display. Soon enough the Ridgebacks found themselves besieged by the heavy shots of Anthony Beauregard, Carl Neill and the offensive hero of the game, Massimo Carozza, among others. It was Carozza who opened the game’s scoring with his very first Ontario University Sports playoff goal. The Stingers’ powerplay had been giving the team some trouble heading into the playoffs but Carozza changed that. With the game’s first numerical advantage, Carozza took a pass from Beauregard and buried the early lead into an open net 16 minutes into the first frame. Just two minutes later, Beauregard and Carozza connected to double that lead after a misplayed puck by Ridgebacks’ goalie Brendan O’Neill. The second period was a chance for both goalies to show off. UOIT got more dangerous as the period went on, but were met by a wall in net. Marc-Antoine Turcotte batted away anything that made it towards his net. His defense cut down second chances left and right to make their goalie’s night a little lighter. While they may have found their feet more in the second period, the Ridgebacks also spent plenty of time in their own zone, after the Stingers hemmed them in and tested O’Neill with chances of their own. Heading into the third up 3-0, the Stingers were in a strong position. The Ridgebacks mounted an attempted comeback as best they could, finally beating the near perfect Turcotte five minutes into the game’s last period. UOIT had no shot lanes, no real room to make plays and anytime they lost the puck, the Stingers were happy to return it to them deep in the ridgeback zone before heading back to defend again. In the final minute, an empty-netter by captain Philippe Hudon sealed the deal at 4-1. With their backs to the wall, the Ridgebacks will have a tough time with game two—and three, if necessary—played at Ed Meagher arena. The Stingers will be happy to see that UOIT won just five of their 14 road games this season while Concordia was a good home team. Game two goes down Friday night at Ed Meagher Arena.